“When a child asks, “why is there a moon?” don’t reply with a scientific answer. Ask them, “what do you think?” He will understand that you are telling him, “You have your own mind and your own interpretation and your ideas are important to me.” then you and he can look at answers, sharing the wonder, curiosity, pain – everything. Its is not the answers that are important, it is the process — that you and he search together”. I approach teaching with the belief that all children are unique individuals who learn through play. The Early Years Learning Framework explains play as a context for learning, through which children organise and make sense of their world. As an early childhood teacher I provide a play based educational program, enabling choice, the opportunity for children to explore areas that interest them whilst interacting with their peers. I believe in inquiry based learning, where students lead and direct their own learning through their wonderings, interests and life experiences. This provides students with more engagement, resulting in deeper learning. Thinking and talking floorbooks are one of the forms for displaying and reflecting student led learning. The floorbooks are readily available for the children to use and look at, for them to reflect on and build upon. The floorbooks are made in consultation with the children so that they have a sense of ownership and can see that their ideas are important and valued. The floorbooks highlight the learning that comes from the opportunities and experiences that the children encounter through their environment. The environment acts as the third teacher, promoting a sense of wonder, curiosity and imagination. The environment supports risk taking within a safe environment and reflects the image of children being competent and capable. The temporal environment holds a sense of predictability that allows for flexibility in order to cater for children’s learning requirements. 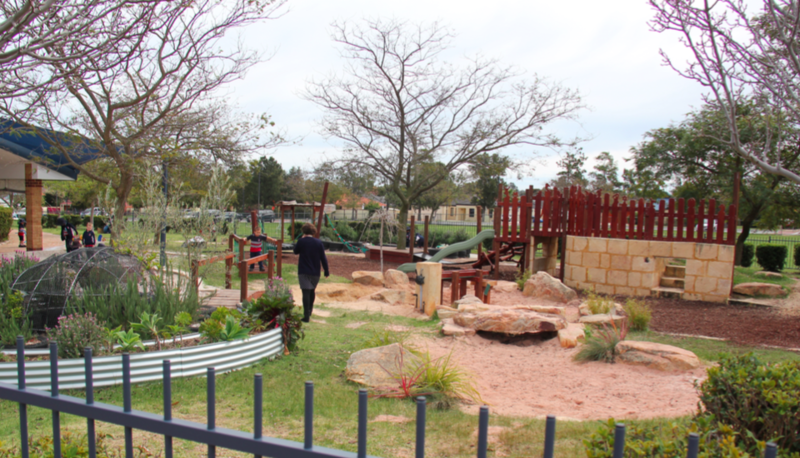 The children are given the opportunity to explore and play in nature on a daily basis. Nature play promotes thinking and problem solving, improves social and physical development and has emotional, mental health and wellbeing benefits. The book “Nature Pedagogy” developed by AISWA, explains that children are more likely to engage in pretend play in natural spaces. Through dramatic play, children continue to develop the ability to represent. This important skill is transferred and adapted into various areas of the curriculum throughout all years of schooling. As an educator I strive to provide a holistic program that ensures children reach their highest potential: socially, emotionally, physically and intellectually. 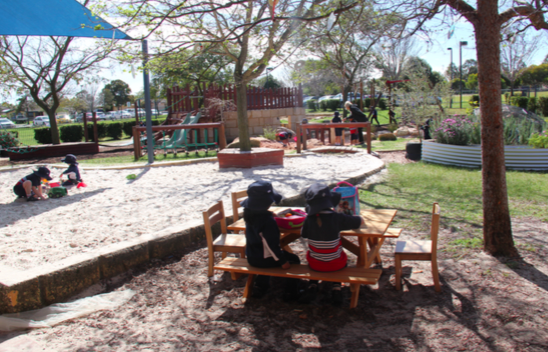 “St Stephen’s School offers a double-stream Kindergarten program, currently enrolling approximately 20 children in each class at the Carramar campus. All children attend four full days. The three teachers are supported by full time education assistants.These 2 classes share a space that previously housed 2 classes with a central ‘wet’ area. Each class has their own mat space and, while there are partitions or doors between each mat area, these are kept open throughout the day, providing all Kindergarten children with access to the large shared space. In turn, friendships develop across the class groups, with the children having an opportunity to interact daily with peers from any of the classes. Parent participation is actively encouraged and the classes often have rostered parents stay to support learning activities. The creation of a home-like space has been a priority when designing the new Kindergarten. Therefore, wooden tables, chairs and display cases were commissioned, and even the curtains were selected for their home-like appearance. 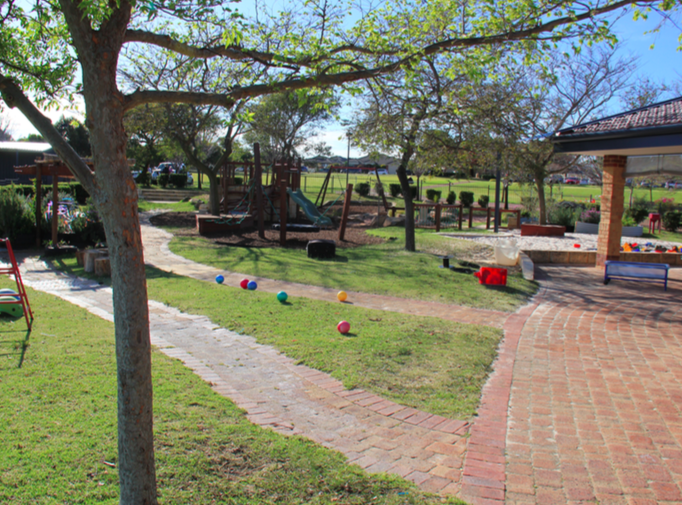 The nature based outdoor environment, provides a wealth of diverse learning experiences including challenging climbing spaces, a vegetable garden, cubbies, mud pits and sand pit, nooks for hiding and play, and a wide verandah”. ~ Excerpt from Case study written by Rebecca Duncan AISWA Early Childhood Consultant.